If you want to make a website for restaurants, the first step is to determine the goals of your restaurant website. Most restaurant websites include a short homepage, a menu that is prominently featured, and a page for reservations. Your restaurant might want to include more than just these few pages. For instance, do you want to accept reservations online? Do you want to allow people to place orders for delivery or pick up on your website? Do you want to set up catering options? There are so many functions that a great restaurant website can carry out. This guide will help you hit the ground running to bring your restaurant website in just a few minutes. Best of all, you can do this without ever writing a line of code. WordPress is a very versatile content management system. It is easy to use, and it has thousands of plugins that can help you manage your website without much work at all. For this reason, it is the perfect fit to make a website for restaurants. Getting started with WordPress is simple. First, you can order a WordPress hosting plan. Then, you can log into the control panel, select Softaculous, and then select WordPress. Softaculous will ask you a few questions before getting started, like wanting to know the URL of the website. Then, you can log in using the credentials that they provide you. If you need any help getting started, feel free to check out the video for step-by-step walkthrough instructions. And if you run into any roadblocks or have any questions with your hosting account, feel free to contact our 24/7 support team. When it comes to finding a good website design (and doing it cheap), ThemeForest has a lot of great options. A quick search for the word “Restaurant” shows that they offer 650+ different restaurant WordPress themes. To narrow down all of these options, you can filter by ratings, the date it was last updated, and popularity. If you are looking for a free option, there are also lots of free restaurant themes at WordPress.org. The quality of the themes may not be the same as the ones from ThemeForest, but all of the themes are provided completely free. For the purposes of this tutorial, we will use a free theme provided on WordPress.org. When you start a new website, there is a lot of content to add. For one, there’s the homepage that needs to direct visitors to the right page, the about page that needs to provide some background on the establishment, the menu, the contact page, and any pages for other locations of the establishment. All content can be managed from within WordPress under the “Posts” and “Pages” menus. 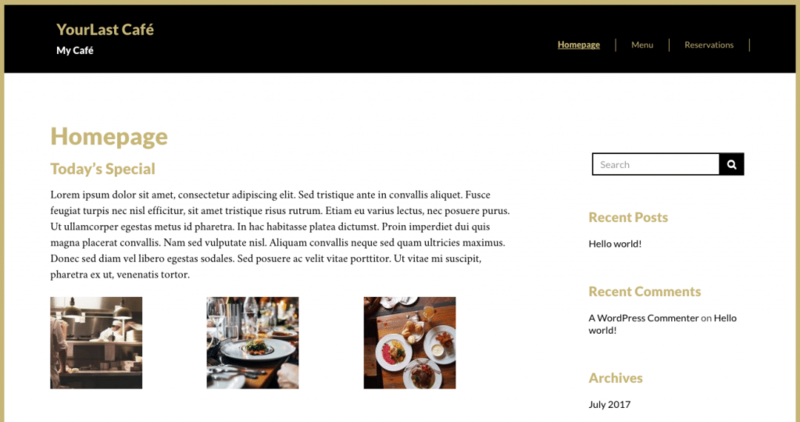 A semi-complete restaurant website. It could be improved with more content and images, but it is completely functional. It is very common to see menus provided as their simple PDF files that the site links to directly. While this practice may be quick and dirty, the best option is to set up a web page with the same information. Web pages are more easily indexed by Google, and visitors will not have to leave your website in order to view the menu. To display the menu, you can set up a page in “Pages”, or you can use a plugin to do the same thing. A list of useful plugins are provided at the bottom of the article to help you extend your restaurant website. Next Post OpenVZ vs KVM VPS – What is the difference?